Dette bildet er tatt sommeren 1944 og viser smedgjengen i Falstad fangeleir. Fra venstre ser vi rørlegger Roy Gjørtz, samt smedene Ole Kjennerud, Gunvald Engelstad, Arvid Alstad og Tormod Hegdal. Bildet er tatt ved smia på Falstad skolehjem, et par hundre meter fra selve leirområdet. This picture was taken in the summer of 1944 and shows a group of prisoners in Falstad prison camp. 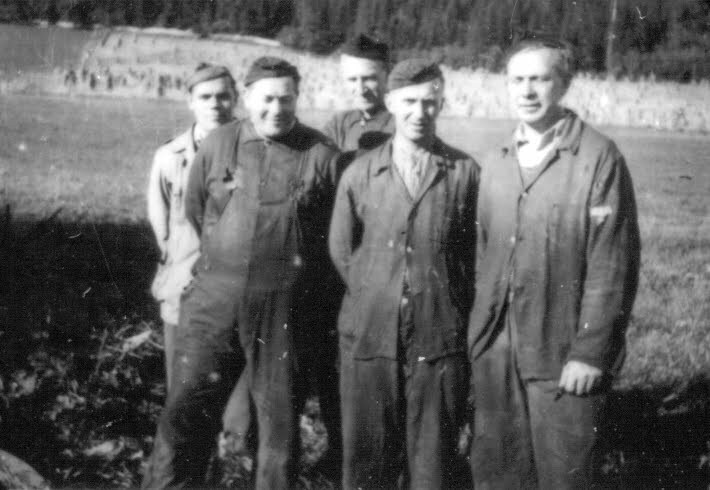 From the left we see the plumber Roy Gjørtz and smiths Ole Kjennerud, Gunvald Engelstad, Arvid, and Alstad Tormod Hegdal. The picture was taken near the smithy at the Falstad reformative school, located a few hundred meters away from the camp area. "I was a blacksmith, so every day I went outside the camp and down to the smithy (...) I had the advantage that I could smuggle a lot of packages. I was never checked. There were many Germans who were down in the smithy and got help from me. I do not know how many keys I made for them. They lacked keys in Germany. And then they came with tin cans. They got food from the nearby farms, and I closed the cans, so they could sent them home to Germany."